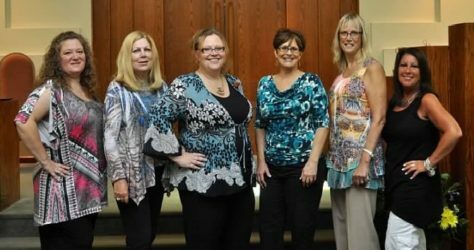 Representatives from local charitable organizations visited our Religious School this fall. After they made presentations about what they are doing in the community, students were given the opportunity to choose how to give their ‘tzedekah dollars’. While the money they put into the bowl for each organization was symbolic on Sunday, at the end of the year those symbolic dollars will be donated to each of these organizations. How much each gets will be decided by how much our students gave to each organization. Tzedekah donations brought in this year will benefit Israeli Guide Dogs for the Blind, Relay for Life (American Cancer Society), Special Needs Athletic Program, and the Homeless Bus. For many, perhaps especially those of us involved in education, summer is the most wonderful time of the year. It is a time for changing up our schedules, heading outdoors (or out of the area), and stepping out of some of our everyday routines for a while. 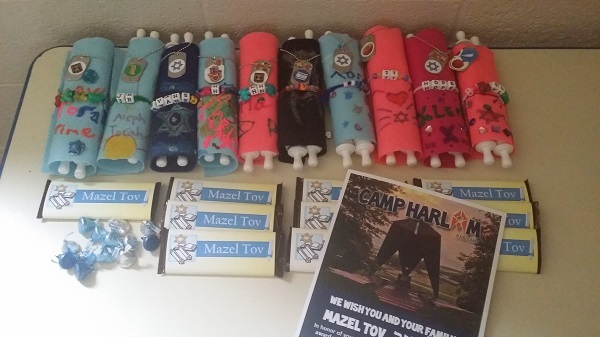 For a number of our Temple families, mine included, summer also means an opportunity for our children to spread their wings at a Jewish camp. Temple Beth Am youth have enjoyed time over the last two months in day camp at Deeny Riback, in short-stay specialty camps at NJY Camps, in session at URJ Camp Harlam, URJ Camp Eisner, Cedar Lake and Surprise Lake, and even in Israel with URJ Goldman Union Camp Institute. Each of these camps does things a little differently. Favorite tunes, camp traditions, amenities, affiliations, specialties, staff and schedules may vary. But as Jewish camps, one of the things they all share is communal prayer, and the celebration of Shabbat. 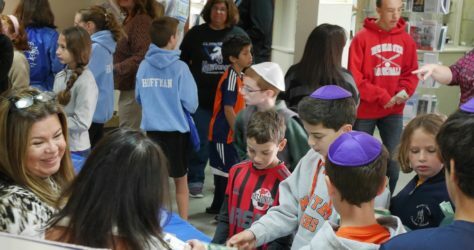 Before I spent time on faculty at Camp Harlam this summer – my first time spending more than a few hours at a Jewish camp – it surprised me a little every time one of our students named “Shabbat services” as one of their favorite things about Jewish camp. I enjoy all sorts of services, especially those filled with music! But when measured up against high ropes, swimming in the pool or the lake, boating, jetskis, trips, campfires, shows, ziplines, robotics, Maccabiah competitions and sports – how does worship, which we offer every week right here at Temple, make a camper’s list of favorite summer experiences? A Friday night service, here or at camp, is familiar to our students. 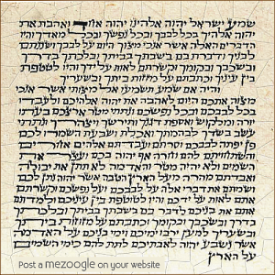 While there may be a different tune here or there, or a change in instruments used as accompaniment, we pray the same Hebrew prayers, and they show up in the same order in the service. 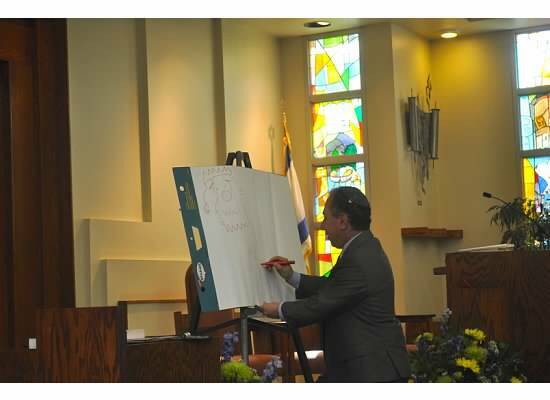 The keva – the framework and routine of our Jewish worship – ties us together. It is a foundation shared by campers, staff, faculty, and visitors from all over. It enables us to participate even when we are still new to camp. Someone new to our services at Temple might experience our worship the same way. But at camp, Shabbat is not just “Friday night” or “Saturday morning” – it is Shabbat. 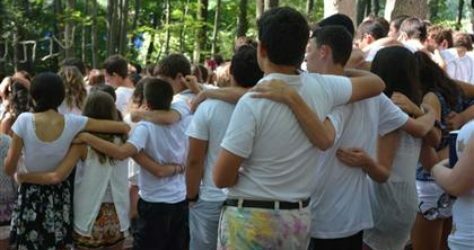 The distractions of the school year are nonexistent as every soul in camp moves into Shabbat together. Worship often takes place in beautiful outdoor spaces. It is difficult not to feel a sense of wonder, gratitude, and awe when seated in an outdoor chapel on top of a hill, with majestic views in every direction. It is difficult not to feel like part of something larger than oneself, when the song of several hundred voices lifts through tall branches in a chapel in the woods, where the Torah rests in the crook of the ancient tree that serves as its ark. It is difficult to not feel the depth and breadth of our Jewish community when sharing worship with so many friends, from so many places – America, Europe, Israel. Sometimes, it can be easier to access the kavanah – the intention, the prayer that comes straight from our hearts – when we get to experience prayer in such a community, in the midst of God’s creations of nature. 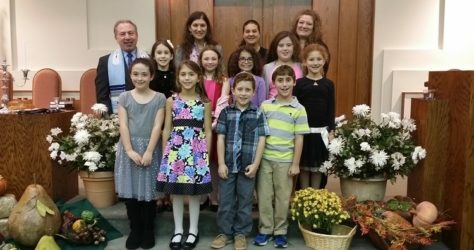 If you have found your way to Temple Beth Am’s Shabbat services this summer, you may have felt something like this this right here in Parsippany. Or Pine Brook. Or Mountain Lakes. Worship held outside, or poolside, or at the homes of our congregational family, with pets or over barbeque, helps us access our feeling of community, and the intention fueling our prayer, in a whole new way. It has given us a ‘summer break’ from some of our comfortable routine, and a maybe few new thoughts about how we experience prayer and community. 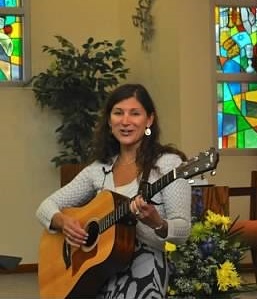 It is my hope for all of us, that we will emerge from our summer worship experiences feeling reconnected, recharged, and prepared to head into High Holy Days with a renewed sense of focus and purpose. We’ve just a few short weeks left of summer. Let’s make the most of them. Our TBA community recently lost Kathy Decker, an active congregant known to many for her various roles around the Temple. 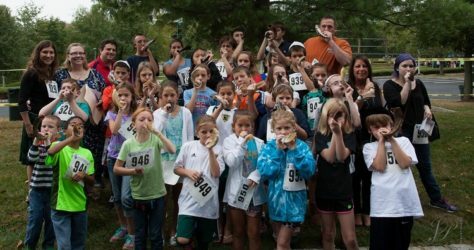 In our Religious School, it would be difficult to find a child who has not tasted her challah at least once, at a service or event here at TBA. But Kathy was also Morah Kathy – a teacher currently leading an adult Hebrew Reading Crash Course, who came in to run special events such as Israel Spa Day or Challah baking classes from time to time, and who had taught younger students as a regular teacher in our Religious School for a number of years as well. While most of our current Religious School students are just a little too young to remember Morah Kathy as a regular classroom teacher, many of our madrichim(teen aides) fondly remember her from the classroom. 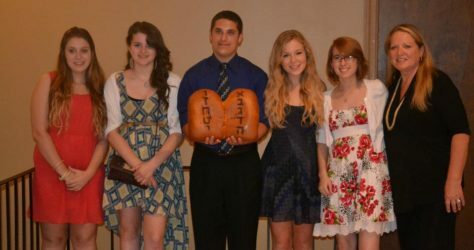 Steven T. (Mercaz), who had Kathy as a morah three different years, also cherished their relationship long after she was his classroom teacher. She would email him photos of special challah that she thought he would enjoy, including one of a colorful American flag. We are all feeling the loss of Morah Kathy in some way, but we were blessed to her in our lives, and she leaves a loving legacy of service and caring in our school and our greater community. Morah Kathy, you are missed. Mazal Tov to our Aleph Class on celebrating their formal Consecration as Religious School students at services on Simchat Torah. Much preparation went into the celebration. Morah Lisa Margolis worked with her Aleph students to customize the covers for the mini-Torah scrolls presented at the service, and Morah Jackie Burge organized a delicious Family Dinner held before services. During the Consecration ceremony, students received blessings on the bima, a chocolate bar to wish them a ‘sweet’ year of learning, a beautiful certificate of Consecration, and a congratulatory certificate from URJ Camp Harlam. Cantor Inna and Rabbi Mills get in on the action! 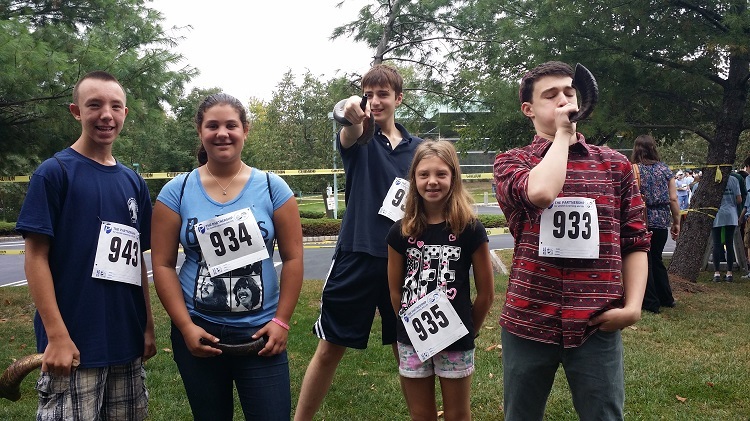 ing together with our community, and enjoyed seeing so many familiar faces at the event.Yasher Koach – great job! – to all participants! And, we’re off! Thank you so much to all of the families who came out to help us celebrate the first day of school in style! 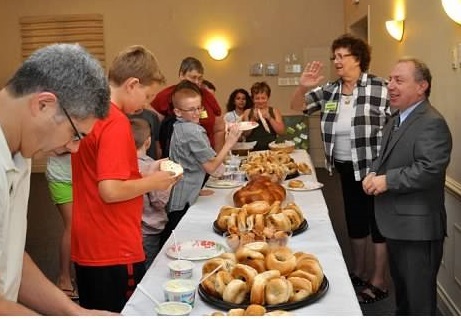 TBA Religious School families enjoyed a delicious bagel breakfast, thanks to the TBA Sisterhood, sang Hinei Ma Tov and the Alef Bet Song with Cantor Inna, watched Rabbi Mills live-cartoon a story as he told it, got to meet teachers (and for the teachers, got to meet parents!) and much more. We are looking forward to an amazing year together.